We are pleased to announce an addition of ground flat stock to their wide range of products! Available in imperial and metric sizes, this product is now available at Carrs Tool Steels at competitive prices. The product is delivered according to DIN 59350. The thickness (top and bottom) delivered in ground execution, both bar ends are saw cut. The material will have a surface roughness of max. 3.2 µ. Supplied fully annealed, ground flat stock is precision ground to close tolerances, enabling finished components to be produced with the minimum of machining. 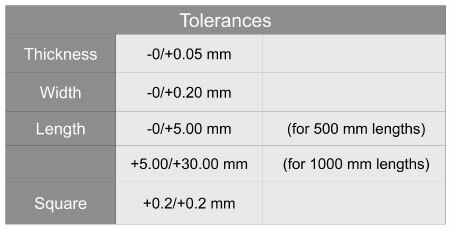 O1 ground flat stock is heat treatable to a high hardness, it possesses good hardenability with excellent dimensional stability and resistance to wear. Typically, available in BO1, at Carrs, we can supply ground flat stock in other grades too!